Writing up the Mariners now might seem a little unfair, given they’ve already played two regular-season games. But check out these two box scores — do they tell us anything we couldn’t have guessed about this team beforehand? Dustin Ackley has a chance to be the team’s next big star; Ichiro has a chance to prove he’s closer to the 4.5-WAR player he was in 2010 than the replacement-level player he was in 2011; Brandon League has a chance to save a bunch of games and make himself attractive deadline trade bait; Justin Smoak and Jesus Montero have a chance to prove they were worth trading away great pitchers for; and Felix Hernandez has a chance to throw eight dominant innings over and over, only to come away with a stack of no-decisions. It took exactly one game for the situation to change. Starting left fielder Mike Carp dove for a ball in Wednesday’s opener, hurting his shoulder and landing on the 15-day DL. Thus Thursday’s lineup featured Seager at third and Figgins vying for the title of weakest-hitting outfielder in the majors by shifting to left. Whether Seattle keeps that configuration, gives Casper Wells a shot in left, or tries something else, this is going to be a very ugly offense — even after stripping out the dampening effects of Safeco Field. Out-making machine Michael Saunders has already been forced into action in place of the ailing Franklin Gutierrez, Brendan Ryan is a terrific defender who’s never going to hit much, and Miguel Olivo has impressive sock for a catcher, but also very possibly the worst plate discipline of any starting position player in the majors. The M’s can’t just hope for Smoak and Montero to hit; they absolutely need both players to mash the ball, or else we might be calling this the worst offense by any measure, yet again. Another decision that has Mariner Nation scratching its collective head. 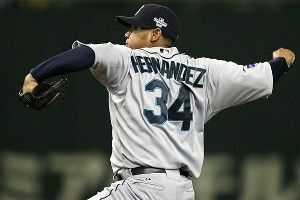 The excellent M’s blog USSMariner.com (which you should bookmark, add to your RSS, tattoo on your brain or whatever it is that cool kids do these days, even if you’re not a Mariners fan), has written multiple posts arguing for Japanese import Hisashi Iwakuma over Blake Beavan in the rotation. In a nutshell: Beavan is a mediocre pitcher with a low probability of suddenly producing great results, whereas Iwakuma has a track record of excellent success in Japan, so it might be a good idea to see if he can duplicate that in North America. It’s kind of like the Figgins-Seager situation, except the (somewhat) older, (slightly) more expensive option in this case is the one with more potential. A few days after that decision, Iwakuma got shelled by the Yomiuri Giants in an exhibition game, his velocity falling below normal levels and Iwakuma admitting his mechanics were off. At any rate, Beavan’s hardly a lock to hold a starting job all season, Kevin Millwood is a late-30s pitcher with recent injury woes, and Hector Noesi, though a popular sleeper in some circles, is hardly bulletproof in his own right. It’s not all that fun to watch a team that might lose 90-plus games. But from a management standpoint, it does allow you to be aggressive in giving players opportunities to win starting jobs if and when others fail. If all goes well, those who eventually claim those jobs could be contributors on the next winning Mariners team. Ackley. His first full season in the big leagues, and he already projects as a plus defender who’ll hit for a high average and draw walks while playing a premium position. Observers say he’s added a bit of bulk this offseason, and for whatever it’s worth (not much), he absolutely blasted a ball over the wall in right-center in Wednesday’s opener. He could be a four-win player this year, with more room to grow thereafter. even sleepers like the Indians look better right now on paper. Let’s take breakouts from Ackley, Smoak, and Montero, a comeback year for Ichiro, and a Cy Young-worthy campaign from Felix, and just accept a lot of mediocrity (or worse) throughout the rest of the roster. Smoak has another underwhelming season, leading the Mariners to wonder if first base is yet another position they’ll need to upgrade as they rebuild.